The low number of ground troops stationed in Afghanistan, combined with an increase in insurgent attacks, has resulted in a dramatic increase in the use of air power. But the resulting increase in civilian casualties is undermining battlefield success. A new report from the Institute of Peace suggests that the massive increase in the amount of munitions being fired or dropped in Afghanistan has fueled popular anger -- and the Taliban resurgence. 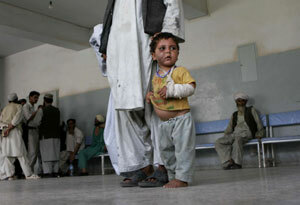 The report is called: Killing Friends, Making Enemies: The Impact and Avoidance of Civilian Casualties in Afghanistan. The report’s co-authors, J Alexander Thier and Azita Ranjbar suggest some questions reporters should be asking about Afghanistan and the U.S. campaign there, what our goals are, and what tactics are likely to achieve them. Q. The current level of aerial bombing in Afghanistan and the nature of the conflict there means that these bombings will inevitably cause civilian casualties. It is hard to say that we don't "intend" to cause these deaths when we know with a certainty that they will result from our actions. On balance, is the damage caused by these casualties in human and political terms worth the benefits of this approach? Q. What are the benefits of the current approach? Is something achieved through aerial bombing that could not be achieved by capable ground forces? Q. Given the current high level of civilian casualties, are collateral damage mitigation procedures being reassessed? Can these procedures be more effectively harmonized among all NATO forces? Q. Some NATO forces have adopted a zero tolerance approach to civilian casualties, and can only call in an airstrike when forces are under attack. Does such a strategy give too much advantage to insurgents, or could such a policy be reasonably adopted by all NATO forces. Q. What factors would lead to a reduction or increase of bombing from this point forward? Q. What would be the impact of bombing in the tribal areas of Pakistan to take out terrorist and militant targets? In the past, civilian casualties resulting from such strikes have caused massive protests in an already fragile environment. A lamb-excuse terminology of collateral damage caused by the ongoing war on terror in Afghanistan and being also caused in Fata(Pakistan),can not exempt the US/Nato authorities from their cherished responsibilties of having an unjust policy adoption that has resulted in killing numerous innocent civilians in these areas.The US- fata policy seems highly incongruous with the dynamics of prescience and prgamatism.Any attemtp to crush the elements of extremism by dint of force, would cause more escalation in exterme tendencies.